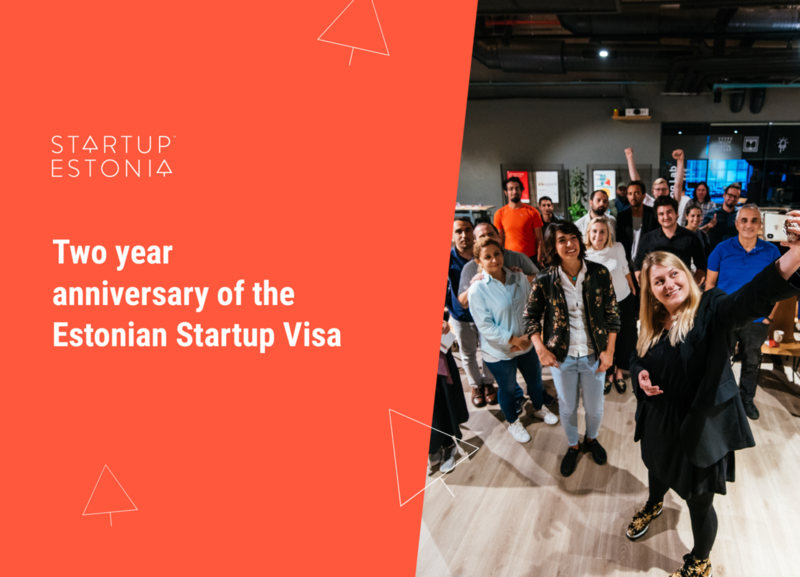 Estonian Startup Visa was launched two years ago. Exactly 2 years since the launch, we have received 1108 applications from companies for the Startup Status and 931 people altogether have relocated to Estonia already or granted the right to do so. On January 18, 2017 the Estonian Startup Visa was launched. It was seen as a new and promising opportunity for Estonian startups and the whole Estonian startup ecosystem for bringing in talent from all over the world and start developing an even more international and diverse community. Since the beginning of 2017, when we launched our programme we have seen a lot more competition between countries with their own successful startup visa programmes. As we were treating it as a pilot programme, our initial goal was to get at least 50 companies to apply for the startup status, that would make the companies’ founders and employees eligible to relocate to Estonia. To our surprise however, within one year the programme attracted over 300 companies wanting to be involved in the tiny but vibrant community of inspiring founders, top startups and even unicorns. In the last weeks of 2018 we received the 1000th startup status application, and we see the numbers growing weekly. “The continuous growth in application numbers is definitely a confirmation not only to the Startup Visa programme but also to Startup Estonia as a whole that Estonian startup ecosystem is among the best in the world,” says Startup Visa Project Manager Merilin Lukk. But without further introduction, let’s get straight into the successful year 2018 of the Estonian Startup Visa. In exactly 2 years since the launch, we have received 1108 applications from companies for the Startup Status. The applications are assessed by the seven-member Startup Committee (the members are Tehnopol, Garage48, Startup Leaders Club, Estonian Business Angels Network, Startup Wise Guys, Superangel and Startup Estonia). 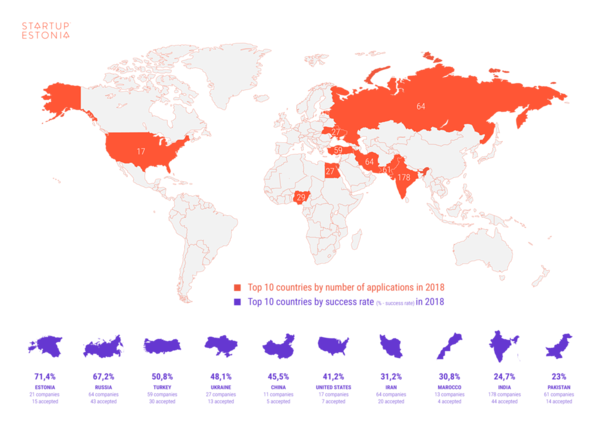 Companies applying to the startup status come from over 80 countries from all over the world, the top countries however have constantly been India, Russia and Turkey among many others. We see that the countries which have the most startup status eligible companies are Estonia, Russia and Turkey with at least 50% of the companies attaining the startup status, making it possible for the employees and/or founders to apply for the startup visa or temporary residence permit. 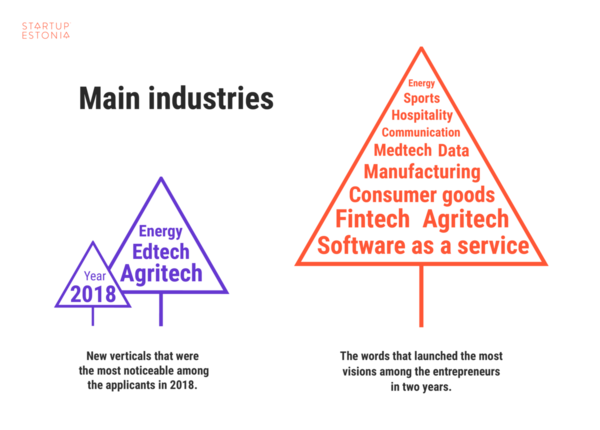 The range of industries is very wide for the applications coming in, but there are some areas where the amount of applications exceeds others. The most popular industries are fintech, business software/software as a service, medtech, consumer goods and hospitality with agritech, edtech and energy sector being the likely success stories in 2019. “We see similar keywords apply also to the Estonian startup sector as a whole. Looking at our success stories over the years we tend to be better in building business software/Saas products but are also strong in the fintech vertical, among others. However, the trends seem to be shifting and as the startup visa applications come from a variety of industries, we also see Estonian startups being successful in other sectors, like edtech, agritech, cybertech, medtech etc.,” says Maarika Truu, Head of Startup Estonia. It is very important to state that, receiving the startup status does not give you an instant access to the Estonian startup ecosystem, but gives you a right to apply for the Estonian D-visa or the temporary residence permit at an Estonian Embassy, or at the Estonian Police and Border Guard Board. Read more about the process here. Who actually moves to Estonia? What is very important for us is the actual amount of people who relocate to Estonia. Below it can be seen that the top 5 countries where the employees and founders relocate from are Ukraine, Brazil, Russia, United States and India. Since the beginning of the programme there have been 931 people altogether who have relocated already or granted the right to do so. 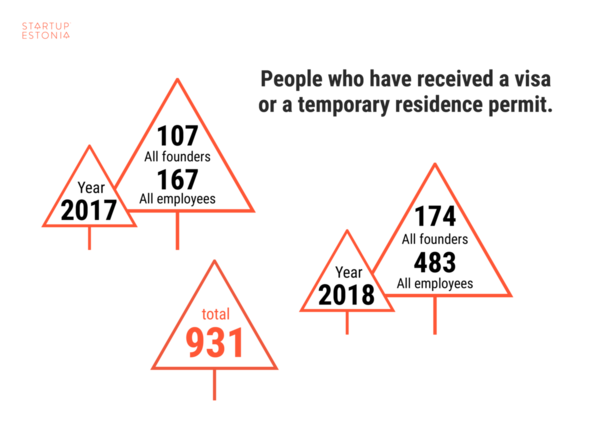 What is also remarkable is that when in 2017 we had 167 employees and 107 founders relocate to Estonia then in 2018 the numbers were significantly larger - 483 employees and 174 founders, meaning we saw a 236% growth in a year. In 2019 our goal is to grow even more - we are expecting at least 1000 additional people to join our lively startup ecosystem in Estonia. Although we are expecting more and more founders to find their way to Estonia to become employers themselves, it is clear that the need for talent in Estonian startups is growing significantly. As 2018 was a record year of investments into Estonian startups, we see that the funds are directly connected to the increase of available jobs in this sector. There are jobs available not only for developers but also for marketers, sales people, customer support, designers, etc. If you are interested in finding a job in the Estonian startup scene, look at the Work in Estonia job offers page. There will certainly be exciting offers for all talented people! “Estonian tech sector is going through the ride of the lifetime. Total employments in our startups passed 5000 in 2018, and is projected to continue the +30% annual growth seen in the last years. Startup visa has significantly helped in the last years for Estonian high growth companies to cope with this need of talented new people to work with.” says Sten Tamkivi, President of the Startup Leaders Club. Whether we talk about Estonian-born or foreign founders, they are all in the center of Startup Estonia’s activities. Startup Estonia’s main goal is to have a supportive environment for founders with great ideas and implementation ability to succeed in building their business. In 2018 we wanted to hear from the founders themselves, what they appreciate the most about the Estonian startup ecosystem. Check what Ralph from USA, Evgenia from all over the world and Avery from Canada have to say about it all. We tested several formats of spreading ideas and information about the Estonian startup community, so in 2018 we launched a podcast series “Starting up in Estonia” where we invited some founders that have come here with the Startup Visa, some very successful Estonian founders and community members, as well as investors, representatives from the government, and so on. Check it out and listen to the first season of the podcast. If you like it, let us know by following our Soundcloud, and we might even start preparing for Season 2! What is also important for us, is meeting the people who relocate to Estonia face to face. That’s why we launched the “Foreign Founders in Estonia” meetup in February, which now has been rebranded as “Global Founders in Estonia” meetup, because the moment people land in Estonia, they are a part of the Estonian ecosystem, where all founders are equal and have global companies. The next meetup will happen already next week, on January 23 in Tartu during sTARTUp Day. Last year was all about meeting the global founders in different countries. We visited altogether 10 countries (Japan, Turkey, Russia, Georgia, Uzbekistan, Azerbaijan, Belarus, Ukraine, Moldova, Serbia), attended and organised so many events it’s difficult to count, and what’s most important, met with local startup founders, employees, and people interested in startups, who gave us a chance to dig into their problems and areas where the Estonian startup ecosystem might be beneficial for their development. “In 2018 we have learned a lot from the founders and they have really helped us figure out how to develop the Startup Visa programme. In 2019, we will still continue to visit these countries where there’s most interest, but also focus more on supporting the people who have already relocated to Estonia by offering onboarding help and helping service providers and public services to figure out how they can help the global founders more,” confirms Merilin Lukk. Check out what goes on at our roadshows from this link. If you want to meet our team follow us on Startup Estonia’ Facebook page to get the latest updates about our events! Join us if you’re around! Find information and test whether your company would be eligible for applying for the Estonian Startup Visa! Find out about working in Estonia and different ways of coming here as an entrepreneur! If you have decided to relocate, get in contact with the migration advisors who can help with your questions! Get to know the startup ecosystem of Estonia! Follow Startup Estonia for all startup events happening in Estonia and come join the next Global Founders Meetup to get to know everyone! Sources: Startup Estonia, Estonian Police and Border Guard Board, Startup Includer. Data crunched by: Merilin Lukk (Startup Estonia) All data is based on citizenship of the applicants.